Bishop Joseph Francis Purcell, Doctor of Divinity, enjoys dressing the part of a prelate of the Roman Catholic Church but "looked harmless enough In his black suit and black silk socks and polished black shoes". He is "no higher than five foot two and he probably weighed no more than ten dollars' worth of wash at the laundromat" but he behaves "like a commanding general". He has grey eyes and tiny elegant feet, and a sense of humor, as when he books into a hotel under the name of John Venditresimo (meaning John the Twenty-third). He works for the department for "Propagation of the Faith" which means that he has no diocese but is in that part of the Catholic Church that works "to extend its care of the faithful". This, it seems, includes kidnapping, if necessary. "He had the purposeful look of a man accustomed to deciding the destinies of lesser people." He seems a master of conspiracy, but he is compassionate too. He explains that "Sin doesn't frighten me. Evil does." And he sees his mission as a fight against evil. He leaves all the legwork to Dave Peck (see below) but is very much the power behind the scenes, and has a very astute idea of what is going on, so much so that Dave tells him, "As soon as I get back to the office, Bishop, I'll mail you your detective certificate, badge and a set of handcuffs." But, even so, it may be stretching things a bit to describe him as a clerical detective. Dave Peck, the private detective whom he hires, and who tells the story throughout, was "six-three, gawky as a television aerial, with an abundance of hand and foot bones". He had a steel plate in his head, "a reminder of five months hanging between life and death after I was smashed by a truck against a garage wall. I had busted up a liquor-jacking ring." This had been the work of the Mafia. He tells us, "I am a coward by disposition and experience .... I frequently curl up for pleasure with books about private eyes, hardcase characters who shoulder their way through boudoirs, booze, and blondes" although his own business is largely concerned with "unimaginative, repetitive petty thieves." That is until he meets the Bishop, and finds that his own, and his wife's, safety is once again threatened. Thomas Patrick McMahon was a Police Justice in Grand View on Hudson, a small town near Nyack, New York. He was also a consultant to a food manufacturer and director of a chain of supermarkets. He uses this supermarket experience in this story. The Issue of the Bishop's Blood was meant to be the first in a series of books about the activities of a private detective and a Roman Catholic bishop, but no further books featuring them were ever published. 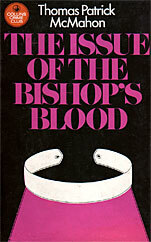 The Issue of the Bishop's Blood was made into a TV movie called The Abduction of St Anne in 1975. I would welcome more information, including his dates and a photo of him. Please get in touch with me via my Guestbook. The Issue of the Bishop's Blood gets off to a promising start when Bishop Purcell commissions private investigator David Peck in Phoenix, Arizona, "to investigate a living saint, and if you believe the person is a saint, I want you to kidnap her and turn her over to the Roman Catholic church." The saint in question turns out to be the daughter of Mafia gangster Joe Santa Croce, a man who had almost caused Dave's death and had left him with a silver plate in his head. She experiences stigmata, and the bishop wants her hidden away out of the country, where there is no danger of her being exploited. It is Dave Peck who does almost all the investigation, with Bishop Purcell just turning up from time to time in unlikely locations, and exercising power behind the scenes. But he refers to it all as "our plan", although Dave tells him "We don't have a plan, Bishop. In fact, I don't have a plan. Maybe an idea or two. But there is no place in it for you.". However, the author writes with real understanding about the Roman Catholic Church and its concerns with stigmata, with references to the (real life) Thérèse Neumann who was also associated with miraculous healings and the ability to be in two places at once. It sounds, as the Bishop admits, "A very bit much". But "even the most stubborn of the sceptics about the stigmata have admitted there was decidedly something going on .... The wounds do bleed. They bleed real, analysable blood, and the wounds do heal quickly. What troubles the scientists is that the blood has the odour of violets." Also "In true stigmatists like Neumann, something terribly strange happens. They stop eating; they never take food." And this is what seems to be happening to the girl in this story - and she even claims to have seen Christ, although surprisingly little is made of this in the story. The author writes with some humour, as when Dave is attacked with the bayonet-like points off umbrellas welded by two little old ladies who accuse him of being anti-Catholic. "They looked like before and after Weight Watchers - one thin and gaunt, the other plump and solid." But the plot is rather slow-moving, and it is difficult to feel very involved. The ending is unexpectedly, even unnecessarily, violent, and the real significance of the supposed "saint" is never really adequately explored. This is the cover of the UK edition. The emphasis here is very much on the bishop, although in the story it is Dave Peck who does nearly all the actual investigating.